All transactions are safe and secure with a reliable history in online purchasing behind each of our associates. 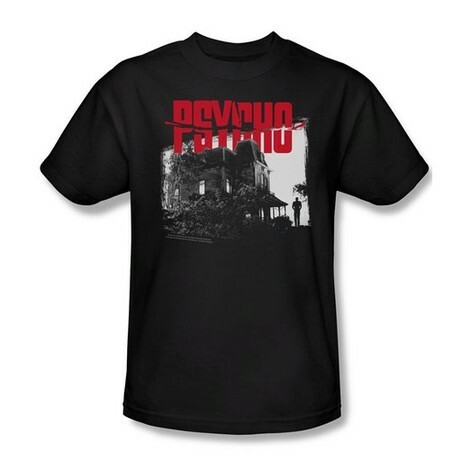 Buy the Psycho House t-shirt to own Alfred Hitchcock clothing and merchandise. Like many of the other Alfred Hitchcock t-shirts we have presented to you, this Psycho t-shirt features a memorable image from the Master of Suspense. In this case, it's the movie's ominous house on the hill. If this is too frightening for you, feel free to step back to the basic Vertigo shirt or North by Northwest t-shirt. Since no one can resist a good scream, make sure that you also check out the Birds costume and Psycho mother outfit, perfect to pair with a Bates Motel sign. In addition to the Psycho House tee above, browse the Alfred Hitchcock Clothing Gallery for more apparel like men's and women's clothes, kids shirts or hoodies.